Reader Daniel Sharing: Miraculous Icon of Mother of God "Unexpected Joy"
A Sharing: The Miraculous Icon of The Mother of God of "Unexpected Joy"
"Rejoice thou who art full of grace, the Lord is with thee!" The history of this icon is related by the Holy Hierarch Dimitry of Rostov in his work, "The Bedewed Fleece". There was a man who despite living his life in sins [some sources say that he was a daily pick-pocket thief in the market place ] nonetheless he had a pious love and devotion to the Mother of God. Without fail, he daily prayed before her icon, in a local church, on his way to the market, saying those words once spoken by the Archangel Gabriel: "Rejoice thou who art full of grace!" It came to pass that as he was about to go off to engage in his sinful activity in the market place, he turned to pray before the icon of the Mother of God. Immediately he began to tremble, as he saw the image of the Mother of God become animated and appear to move. The wounds on the hands, feet and side of the Divine Infant opened up, and from them burst forth blood. Falling to the ground, the transgressor shouted: "O Lady, who has done this?" The Mother of God answered: "You and other sinners once again, like the unrepentant Jews of old, are crucifying my Son. You call me merciful. But then why do you insult me with your lawless acts? "O Mistress", answered the sinner, "may my sins not overcome your inexpressible goodness! You are the only hope of all sinners. Entreat your Son and our God on my behalf." Our Mistress twice repeated her prayer to the Infant Christ, but He remained adamant, until finally He verbally and audibly responded to the persistent entreaties of His Mother: "I will fulfill your request. May your wish be granted. Because of you, this person’s sins are remitted. Let him, in token of forgiveness, kiss My wounds." And lo, the forgiven sinner, before whom the inexhaustible mercy of the Mother of God was manifest in such a wonderful manner, raised himself up from the ground, and with inexpressible joy kissed the wounds of his Saviour. From that moment, he lived a clean and pious life. This event provided the faithful with the incentive to write this "Unexpected Joy" icon of the Mother of God. 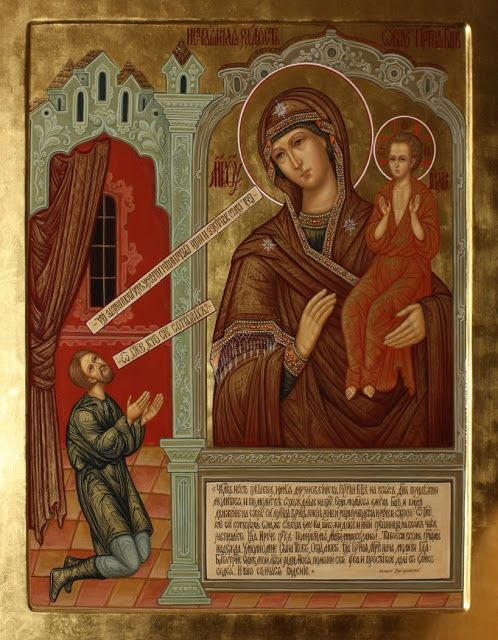 On this icon is depicted a man, on his knees, praying before the image of the Mother of God. Below the image are usually written the opening words of the story: "There was a certain transgressor". Through the holy prayers of the Mother of God and of all the saints.